With all the interest in short sales and foreclosed properties in Eugene – Springfield, I decided to take a look at the sales statistics for 2010. Normal, non-distressed, sales comprised about 3 out of 4 sales in Lane County. Bank owned properties, also called REO (real estate owned) and foreclosures, were a little more common than 1 in 6 sales in Lane County. Short sales were 8 % of last year’s sales, or fewer than 1 in 10. 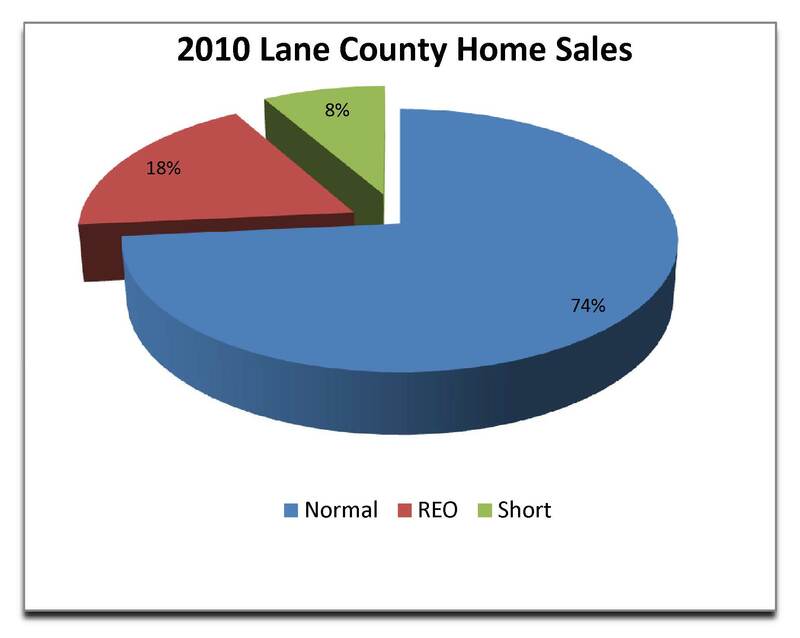 With distressed sales making up 1 in 4 sales in Lane County in 2010, it still makes them far more frequent than in years past. It was and still remains a buyers market in Eugene and Springfield, Oregon. This entry was posted in Eugene Realty Listings, Real Estate and tagged 2010 real estate sales, distressed property eugene springfield oregon, Eugene Foreclosure, Eugene Real Estate Blog, Eugene Short Sales, Lane County foreclosure, lane county real estate sales, Lane County Short sales, Springfield foreclosures, Springfield short sales. Bookmark the permalink.